Access over 300 streaming services, play PlayStation Now games and Blu-ray movies with the Sony BDP-S3700 Blu-Ray Disc Player. Featuring full HD 1080p Playback via HDMI, 1080p Resolution Upscaling, Dolby TrueHD, and DTS-HD Master Audio; the BDP-S3700, lets you enjoy your favorite movies with astonishing detail and a dynamic surround sound experience. With over 300 streaming services you can play movies, TV, music and more and enjoy instant access to hundreds of streamed PS3 games with no game console required. The BDP-S3700 is engineered to provide a stronger and faster Wi-Fi connection for stability and speedy performance when streaming. Additionally, the Blu-ray player features the Sony SideView app, Miracast screen mirroring technology, and a customizable, user-friendly interface. 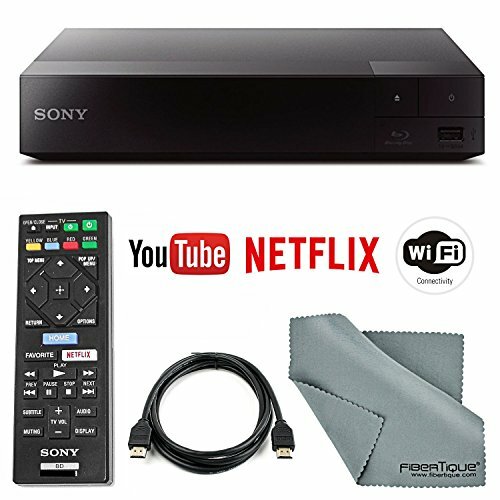 The Sony BDP-S3700 Blu-ray player opens the world of entertainment for you with higher quality video and audio than ever. HDMI Cable - connect to the player’s HDMI port for outputting to an external display and enjoy the highest quality audio and video entertainment. FiberTique Cleaning Cloth- 100% cotton cloth is designed to clean all electronic devices. Screen Mirroring allows viewing Android mobile devices' content on the TV with miracast screen mirroring technology. Built-in Wi-Fi and Ethernet for streaming movies, TV shows, music, apps and more. USB port to connect and share stored files via USB or an external hard drive directly to the blu-ray player.